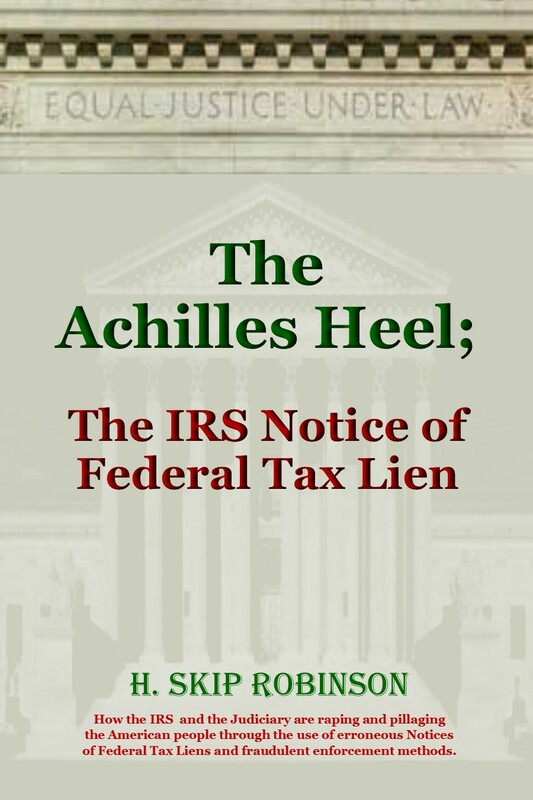 I have finally published my first book on Amazon, The Achilles Heel, The IRS Notice of Federal Tax Lien. I found that the NFTLs being filed by the IRS are legally insufficient thus lawfully unenforceable because the do not note the “tax liability giving rise to the lien” on them, as required by Federal Statute and case law. It appears as many from the tax honesty suspected, they are not able to note the federal statute on the their Liens, which shows their authority, because no such law appears to exists. I say appears because no one has yet to ever show it to me or anyone else and God knows I have asked many times and in many ways. Remember when We The People formally Petitioned (with 62 questions relating to the income tax), the appropriate Officials, including all of Congress for redress of Grievances under the 1st Amendment and not one Official answered the questions, even when we sued them. I was one of the plaintiffs. They obviously couldn’t answer the questions or the house of cards would have come tumbling down. I think it’s their Achilles heel. We need to wage a full onslaught legal attack now at the State Court level. FYI; don’t let the Judges move it to the District Court from the State Circuits, because we have found that they will then dismiss it for lack of jurisdiction, which the due obviously “appear” to lack.